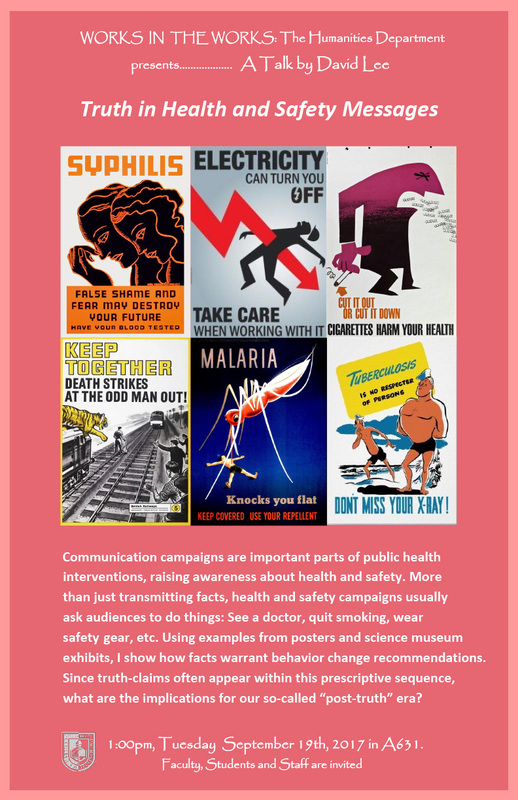 Communication campaigns are important parts of public health interventions, raising awareness about health and safety. More than just transmitting facts, health and safety campaigns usually ask audiences to do things: See a doctor, quit smoking, wear safety gear, etc. Using examples from posters and science museum exhibits, I show how facts warrant behavior change recommendations. Since truth-claims often appear within this prescriptive sequence, what are the implications for our so-called “post-truth” era? Everyone is invited to attend. Refreshments served.